Quite often customer service representatives over-estimate customer knowledge about their products or services. And as a result use professional jargon while talking about their offering. To avoid misunderstanding try to provide detailed explanations and descriptions of what you are referring to. What will your customers think if you send “?” instead of writing “I do not understand what you mean”? In most cases they will be confused because they do not expect to see abbreviations and sms language in B2C live chat. Try to avoid them yourself and train your team to avoid any kind of abbreviations, except those ones which are used in business communication. Honest and positive language keeps the door open for further interactions. Your customers will not feel unheard and as though it was a waste of time to contact your support chat. However, if you sound robotic and repeat phrases, your customers will feel uneasy and will think twice before dealing with your company in future. It is also easy to fall into a trap of having template responses, since very often customers come with the same questions. Though it is very handy to have ready-made responses in most cases, you should be trying to answer the customer’s unique query, rather than trying to fit it into one of the existing templates. Just think about something positive while giving bad news. This will help you to choose the right language intuitively. Avoid saying “No” directly, try rephrasing using positive language. For example: “I understand how that would be useful, but I’m afraid we don’t have plans to implement that feature soon” or “We sent your item today. Please accept our apologies for this delay. It was our fault and as a bonus we added to your package a coupon for discount for future purchases in our online store”. Positive language and right phrases smooth away the effect of negative news and give you time to find a solution and deliver great customer experience. After the bad news is delivered and solutions are identified, track any progress made in solving the problems that led to the bad news. When you solve the issue or release the feature your customer inquired about, notify your customer and deliver good news. Your customers will be grateful and will share their experience. The most simple sentences follow the subject-verb-object format. This means that using the passive voice in live chat may detract from the message you are trying to communicate. Moreover, active voice sounds more natural and friendly while with passive voice ideas are hard to follow, especially when they are complex or technical. The only thing your customer has to do is to pay for the service or products you provide. If there are some actions to be completed by your customer never use “You’ll have to” or “You must”. Using “We need to…”, “You’ll need to” or “Please [action description]” is much better and will not force your customers to think you are giving them orders. “I don’t know” does not really help your customer and does not show the best side of you as a customer service representative. Instead, it will be better to say “Let me check this for you, one moment, please” and do your best to find out the answer. 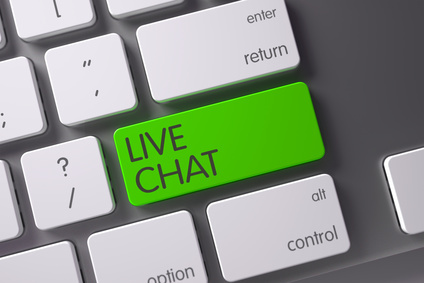 Live chat empowers you to send links directly in chat or even navigate your customers without bothering them with links. Before contacting you, customers have already explored your website. And if they ask that question this means they did not find an answer on your website for some reason. If such questions repeat in future, you’d need to consider updating your website and making things clearer. These words do not inspire confidence in what you write and appear to be quite unnecessary. They remove focus from where it should be and consume time for typing. Just get rid of these words. In case you have some assumptions, try expressing them another way: “There might be an issue here, let me check this”. Today our customers have high expectations and every word you say or write really matters. They become highly frustrated if they are not given special attention and their issue is not resolved timely and respectfully. Save this list of words to avoid in live chat and make sure you do not use any of them in your future interactions with customers. This entry was posted in Articles, Tutorials and tagged customer service tips, words to avoid in live chat. Bookmark the permalink. Thank you, Olga, for that informative post. One thing I appreciate as a consumer is brevity in chat communications. I like it when the customer service rep gets to the point and truly addresses my questions. Thank you for your comment, Sylvia. I am glad you found my post useful and informative. Thanks for posting very useful article. It really helped me a lot. Thank you for reading our blog, Todd. I totally agree with you that co-browsing during the chat session helps to avoid unnecessary questions. live chat is the fast way to touch with customers, thank you for sharing good information blog. Thank you for your comment, Gregory. I am glad you liked my post. Hi, Olga! Thanks for the tips, it helped me a lot. Excellent tutorial! Without knowing I was making these mistakes. Thanks for sharing helped me a lot.